Yesterday’s cold snap (in to work at 75° F, out at 54 ° F) was quite shocking and had me resisting the urge to mull some cider, pull out my waxed cotton and put on my wellies. As much as I love summer, I do secretly relish a mild cold spell that gives you a reason to go outside and be active without sweating buckets and still looking damn cute while doing it. 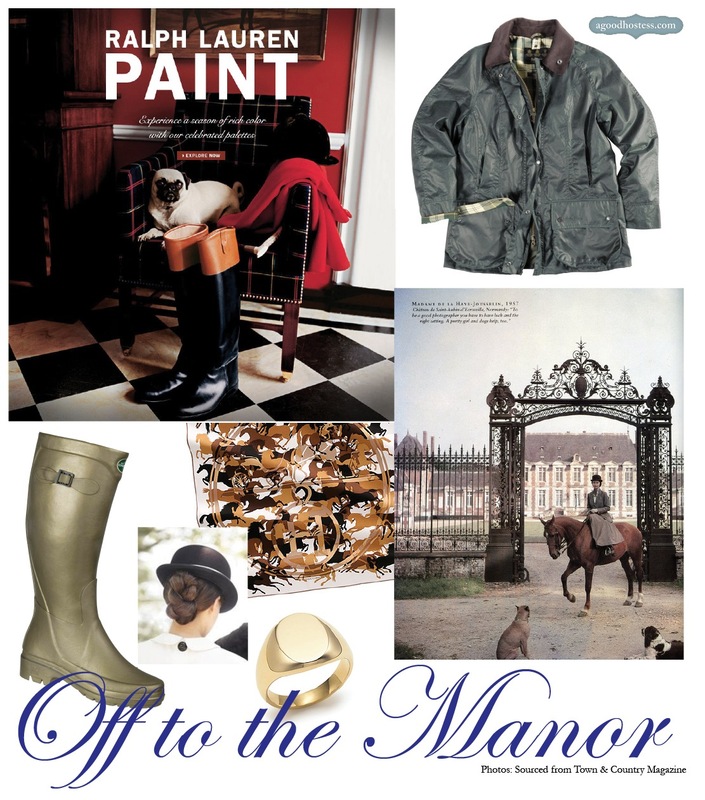 So here’s my ode to the start of fall – a mood board inspired by estate-owning, horse-riding aristocrats. It’s a timeless aesthetic, but I’ll level set with you – I do not ever want to ride a horse (they are terrifyingly huge and it weirds me out how they poop as you sit on them). I just want to look like I do. Welcome Fall. Credits (clockwise): Fall 2011 Ralph Lauren Paint advertising, Barbour Classic Bedale waxed cotton jacket, Madame de la Haye-Jousselin (T&C, 1957), Tiffany & Co. signet, Hermès Ex Libris en Camouflage silk scarf, equestrian updo (T&C, 2011), Le Chameau rubber hunting wellies.